Explanation: Making landfall in Oregon, the Moon's dark umbral shadow toured the United States on August 21. Those gathered along its coast to coast path were witness to a total eclipse of the Sun, possibly the most widely shared celestial event in history. But first, the Moon's shadow touched the northern Pacific and raced eastward toward land. 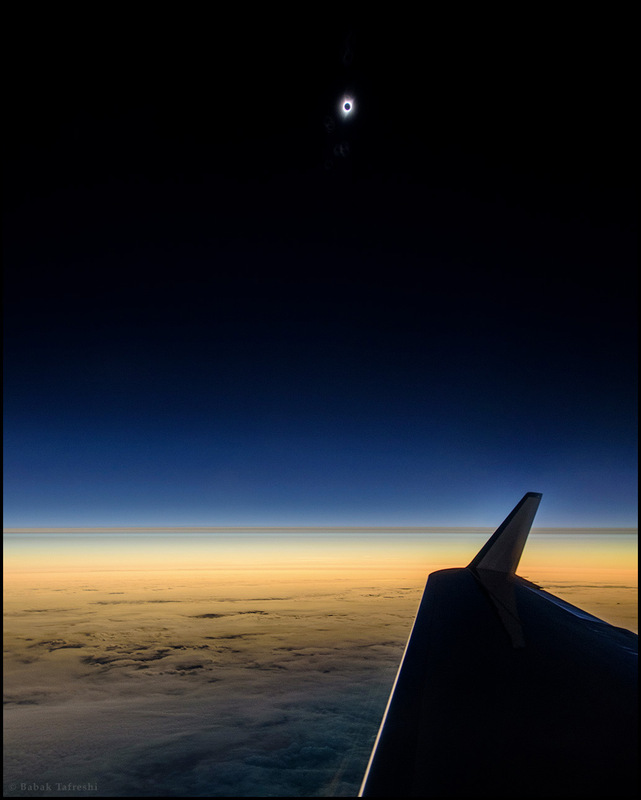 This dramatic snapshot was taken while crossing the shadow path 250 miles off the Oregon coast, 45,000 feet above the cloudy northern Pacific. Though from a shorter totality, it captures the eclipse before it could be seen from the US mainland. With the eclipsed Sun not far above, beautiful colors appear along the western horizon giving way to a clear, pitch-black, stratospheric sky in the shadow of the Moon.